When you attend a silent film screening with live accompaniment, you can’t be sure that the music you’re going to hear will be to your taste. It’s rare that the music is actually bad—but sometimes it seems wrong for the film you’re watching; or at least, wrong for you. This is a risk you take, mitigated by the possibility that you’ll hear an expertly delivered, revelatory score instead. One that approaches the film in ways you hadn’t considered. I’ve been to such screenings. They’re wonderful. Last night wasn’t one of those nights. Let no one accuse TIFF Bell Lightbox of being risk averse. Yesterday evening’s presentation of The Grub Stake Revisited, recut from Nell Shipman’s The Grub Stake (1923), was one of the oddest accompanied silent film screenings I’ve ever attended. The screening wasn’t a success, for reasons I’ll elaborate on below, but it was memorable. Good for me. Better a car wreck than a flat tire, when you’ve got a blog entry to write. 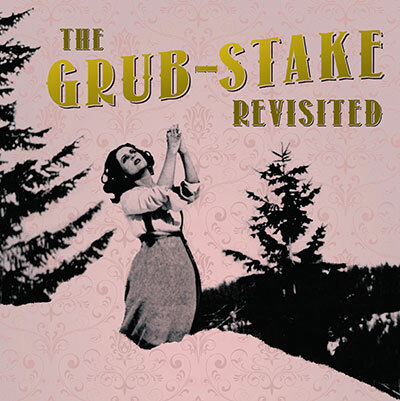 The Grub Stake is typical of its time and type—simplistic in its characterizations and direction, but fast moving and strong on action, particularly in the outdoor scenes. It’s also a pretty serious movie. But last night’s audience peppered it with laughter throughout. That’s because we were treated to more than just a musical score (composed by Daniel Janke and performed ably by musicians on cello, piano, marimba, and other instruments). We heard live dialogue, as well. Shakespearian dialogue. How to describe this? What have you heard that sounds anything like it? A Japanese benshi performance, perhaps? In Japan, silent films were often accompanied by a live narrator, who described the action you were watching. There are still a few benshis around, so you may have heard one live, or on a special DVD track. But the job of a benshi is to enhance the film. The Grub Stake Revisited, as near as I can tell, exists to enhance the dialogue. Imagine six actors, three on each side of the stage, with the musicians seated between them, reciting quotes from various works of the Bard, while the film plays above. The quotes match the action, more or less. Each actor “voices” a main character, plus secondary ones. 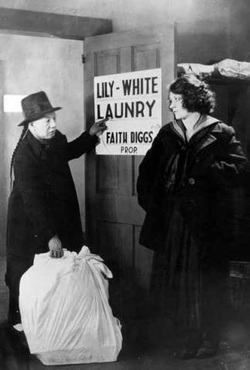 The film is missing its intertitles, but is otherwise mostly whole. That’s what we saw. And heard. Now, I am a fan of innovative approaches to silent film accompaniment, so long as the music stays faithful to the film. The music accompanying The Grub Stake Revisited was uneven, but certainly nothing you’d complain about. The trouble is that the six actors were also accompanists. And I’m not sure they saw themselves that way. Music accompanying a silent film is meant to evoke mood, enhance images—it is rarely used to simulate the sound of something we’re watching. There are exceptions, like the sound of a door being knocked, or a bell ringing—common because the images are so frequent, and the sounds so easy to reproduce. But for the most part, we’re listening to music while watching pantomime. It is a rewarding experience, but one that requires concentration, because your brain must work to unify two independent pieces of art: one visual, one aural. 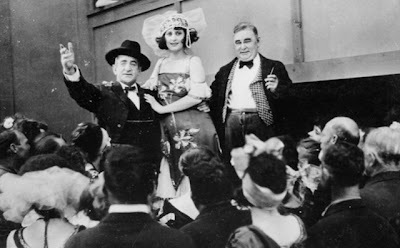 It would be possible to set up a troupe of actors onstage at a silent film screening and ask them to voice the characters onscreen. I’m sure this has been done, though I’ve never seen it. Maybe it would work. But it wouldn’t work like The Grub Stake Revisited does. By reciting dialogue that is thematically consistent with—but aesthetically dissonant from—the images we’re watching, these six actors became like wayward musicians themselves. The actual music only made this worse, as the musicians often seemed to be battling the actors for control of the action, degenerating the whole thing into noise. Do you enjoy hearing two songs at once? The passages are sublime, of course. It’s Shakespeare, after all. But they made it difficult to focus on the story and impossible to invest in it emotionally. Quality poetry deserves to be focused upon, interpreted; so too does the quality pantomime at which Shipman and her fellow actors were adept. I submit that you can’t appreciate both at once. It’s multi-tasking. And no one’s really that good at multi-tasking. Notably, the show got its biggest laughs when the actors’ dialogue matched the film too closely. That’s when the whole thing seemed silliest: when you really put the words into these characters’ mouths. Even their one attempt to play it straight, late in the film, was disastrous. Faith is on the run, alone in the Yukon winterscape: She’s exhausted, frightened, cold. Breathing heavily. 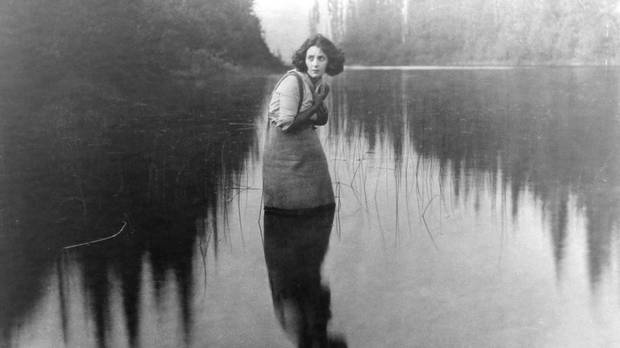 At this point, in a traditional silent film, scored in the traditional way, we would imagine the sounds of gulping air, snapping branches, snow crunching beneath her feet, and so on. The musicians would give us the urgency, intensity—emotions, themes—and we would do the rest. But in this case, the actress voicing Faith gave us something else: the heavy breathing itself. This was not accompaniment, it was a sound effect. And absent any other sound effects (like the crunching snow, for example), what do you think that sounded like? If you’d closed your eyes at that moment, you’d be thinking of a different kind of film. The actors and musicians who performed last night worked hard. Their timing was impeccable, and their talent is not in question. They are professionals. 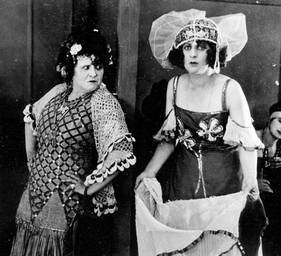 But so too were Nell Shipman and the other members of her cast in The Grub Stake. I wanted to see what they were trying to do, and decide for myself if it worked. They deserved that much. The Grub Stake Revisited was screened and performed at Toronto’s TIFF Bell Lightbox on Monday, May 6, 2013. A second performance, scheduled for this evening, has been cancelled. As a silent film fan, I'd think I'd rather have a root canal than see the performance you described. The film should be left to "speak" for itself. The worst musical accompaniment to a silent film I've witnessed was at the Wexner Center at OSU, where a local musician performed mournful, dirge-like synthesizer music to accompany a whimsical, early Douglas Fairbanks comedy. It was unintentionally surreal. And not in a good way. For some fine silent film accompanists, I recommend Dave Drazin and Phil Carli, to name just two. Bill O'Meara (Toronto) and Makia Matsumura (New York) are both excellent pianists I've had the pleasure of hearing live. They're great people, too. It's a tough job.